If you're any of those cities, come out and see it and support the film! If you're in New York, go here for a special $20 Screening Ticket/DVD bundle offer. If you can't make it to the screening, swing by our panel at 12:45 in Room E201. We won't be screening the whole film, but you can get a preview. And, I'll be hanging out at the Sequart booth (#655) all weekend, signing copies of Our Sentence is Up, and the new Minutes to Midnight, an anthology about Watchmen featuring an essay by me. 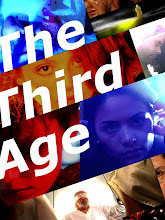 And if that's not enough, check out the trailer for the second volume of The Third Age!